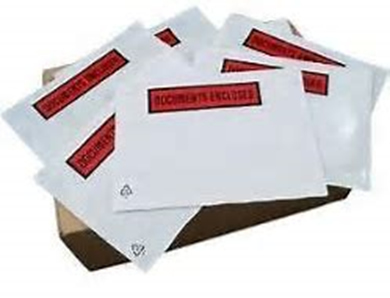 Whenever you are sending your parcels out in the post or via courier, documents enclosed wallets are an essential way to display the destination address at the same time as securing any paperwork for easy access. Extremely popular across a huge range of industries our documents enclosed wallets (or packing list envelopes) are available either printed with Documents Enclosed or unprinted and from sizes starting at A7. Self-adhesive backed, they are designed to safely and securely contain documentation, such as invoices, delivery notes, packing lists, etc. Made from strong and durable polythene, our documents enclosed wallets are waterproof and tear resistant.